Other airlines already offer the service but Ryanair is following suit and promises that a new corporate travel product is also in the works. 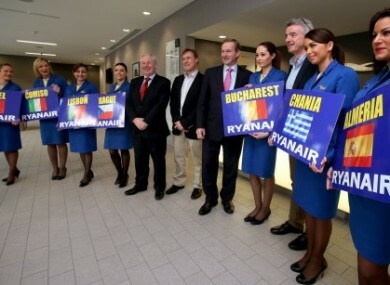 Ryanair cabin crew with Minister Michael Ring and Taoiseach Enda Kenny in November of last year. RYANAIR ARE TRYING to make it easier for people to travel in groups with the introduction of a new group booking service similar to that employed by other airlines. The service allows travellers to block book at least 20 seats on a flight with the person booking not required to included the names of all the passengers at the time of booking. Half of the names have to be submitted halfway between the booking date and departure date with the remainder of the names due 14 days before the departure. The total payment is required at the time of booking. Ryainair say the group bookings are designed to allow for greater flexibility of travel for schools, sports clubs and all other large travelling parties. Other airlines already provide such services with Aer Lingus allowing it on bookings with at least seven travelling passengers. Ryanair also said today that they are to announce a new corporate travel product in the coming weeks which will include “flexible tickets” and fast-track services through certain airports. Ryanair CEO Michael O’Leary said upon the announcement of the group booking service that the airline will target the group and business travel markets this year. “2014 is set to be a very exciting year for all groups and business passengers as Ryanair’s entry into these markets will significantly lower their costs of travel,” he said in a statement today. Email “Ryanair launch group booking as it targets large travelling parties”. Feedback on “Ryanair launch group booking as it targets large travelling parties”.